← Chicken Fingers Bento, yet again! It was another Friday night and we didn’t know where to eat. We didn’t have dinner plans, but the lateness of the hour was enough motivation to find some grub. I suggested Café Mediterranean, since it’s been months since I last ate there. It wasn’t difficult to persuade my mom & J, since at that point, they were both in kahit saan (anywhere will do) mode. While getting them in the restaurant was easy enough, ordering wasn’t. In the end, I ended up selecting the Kebab Platter (P640), figuring that you can’t go wrong with a selection of beef, pork, chicken and kofta kebabs. I was just beginning to order a sampler platter of my favorite appetizers when the server politely cut me short. Apparently, the kebab platter already had the appetizers I wanted to order. He also informed me that it came with 6 pieces of pita, more than enough for the three of us, so we simply got the platter and some drinks. It’s supposed to serve 4, I told my companions, so I guess not getting anything extra would be all right. Still, despite the descriptions on the menu, and a fair idea of what Café Med food is like, nothing quite prepared me for the meal that was. 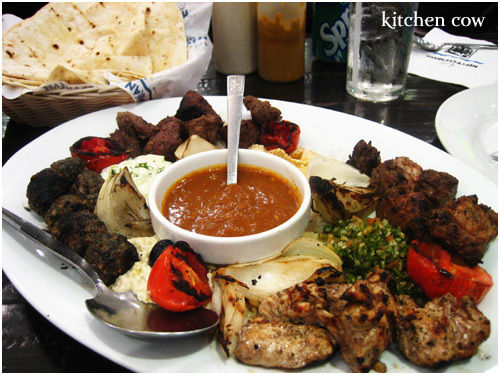 We were served a large platter of the abovementioned kebabs, thankfully removed from their skewers for hassle-free sharing. The large serving dish was also laden with generous mounds of hummus, tzatziki, baba ghanoush, and tabbouleh, a large dish of what we guess to be a thick curry sauce, and a couple of grilled tomatoes and onions. Honestly, I was expecting token amounts of the appetizers, but the dollops on the serving dish were more than adequate. And the flavors! The beef was grilled to perfection, just a little over medium. The meat was slightly pink on the inside. It was juicy, tender and flavorful. The chicken was good as well. Generous cuts of chicken white meat, seasoned and grilled to a tender, moistness. The kofta was as good as it gets. A medley of smokey flavors and distinct spices I just can’t put my finger on. But the star of the platter was definitely the pork. Well-seasoned and bursting with flavor, it was tender to the bite with just a hint of spiciness. Of course, the side dishes could barely be considered extras. The hummus was smooth and perfect as always (if I could only make hummus as good as theirs), spreading a nutty-smooth texture on the warm pita bread. The tabbouleh was cooling; the lemon offering a nice bite against the refreshing mint. The tzatziki was nice and creamy, a rich, thick yet smooth mix of slithered cucumbers and yoghurt. The baba ghanoush was likewise, rich and smooth, with a hearty eggplant taste. Faced with all four, I could hardly decide where to begin. It was one meal that definitely brought a smile to my face. I had nothing to complain about; everything was perfect and the platter had everything I liked best about Café Mediterranean. In fact, I kidded J that if this were a happy meal, it should be labeled Kaoko’s Happy Meal. True enough, it’s wrong to say that the Kebab Platter offers a happy ending. Because it’s a happy event, from start to end. Paseo de Roxas cor. Legaspi St.
1st Level, 18 ADB Ave.
wow, it’s been awhile since i ate at cafemed seeing as cyma is just around the block in greenbelt and since i can share an order of kebabs with a friend, cyma is a more cost-effective restaurant to go to. but with your post i just might head there tomorrow. meep. nicco and i were just at atc yesterday and we were looking for a nice place to eat in. didn’t notice this. sayang. omaygass, mukhang napaka-hearty ng “happy meal” nyo. lalo akong naiinip bumalik dyan! Aaaargh I miss Cafe Med! I miss their lamb stew! The last time I was there was when I had lunch with you haha. That was a loooong time ago. That dish looks so sulit! I should order that next time I go there with friend to share with. I LOVE Cafe Med! I just had dinner there last night. Their Kofta Kebabs with couscous is yummmmmmm. Their marinated olives also! You know, I work very near Greenbelt but have never been to Cyma. I hear good things about it but I worry that it might bore a gigantor hole in my pocket. Still, I do plan to try it out sometime soon, I just hope I can afford it. Oh, that’s unfortunate. But that means you’ll have other reasons to go back home, hehehe. Sadly, I always feel like ATC doesn’t offer much in the way of food choices. I guess the fact that I’m there practically everyday makes it feel like I’ve eaten everywhere interesting even though I haven’t. Still, Cafe Med is one of the restos there that I like going back to, again and again, along with Recipes, Friday’s, CPK and Omakase. Oh yeah, and my new favorite for Paella Negra, Mingoy’s! Hehe I promote it to happy happy meal! Grabe, after writing this, I was craving to go back agad, even if it was only a couple of days ago. And it’s been what? A week now? And the craving hasn’t died. Woe is me. When will you be in the ATC area? Let’s meet up at Town, play some wifi-games on the DS tapos eat at Cafe Med. We can even hang out at Starbucks—as long as we stay outside so I can grab some coffee from SBC before joining you at Starbucks, hehehe. Sounds like a good plan, agree? Boooo! Inggit ako! I want to go back again this soon. I didn’t have couscous the last time pa naman, because I try not to order stuff I can cook at home—but now, because you reminded me, I want to go back badly. Dito fav restau namin ng girlfriend ko… super fav as in! Dami namin fond memories… and we really appreciated the food… Dun sa mga in love dyan. Try to bring your BF/GF dun and feel the ambiance din…. P.S. If pede nga lang kami lang customer dun kasi super romantic din lahat pati yung food perfect! Hahahahaha! Nice one Vhal! Make sure she sees this comment para ma-touch s’ya!